It’s been a while since Neeme Jarvi has stood on the Los Angeles Philharmonic’s podium. The last time he led them downtown was at the end of the 1988/89 winter season, when he was tapped to replace Andre Previn who had withdrawn on short notice with an injury after having resigned as Music Director just a few days prior. The concerts went well enough that he was being talked about by some as a potential replacement for Mr. Previn in the permanent post. Of course, the position was given to Esa-Pekka Salonen instead, and after a smattering of Hollywood Bowl concerts later that year and in 1990, Mr. Jarvi took over the Detroit Symphony and he hadn’t been back since. To put that into proper perspective: in the interim, an entire generation of Angelenos was born and can now legally drink. After Thursday and Saturday night’s concerts at Walt Disney Concert Hall, I hope we don’t have to wait that long to see him again. Judging by the reaction he received from musicians and audience on Thursday and Saturday night, I may not be the only one. On both nights, he led a persuasive account of the Symphony No. 5 by Shostakovich. It was a relatively straightforward interpretation without any obvious attempts to underscore any satirical or subversive elements some believe are present in the score. Still, Mr. Jarvi managed to inject enough personality to keep it from sounding generic. The orchestra played splendidly for him, sounding rich, taut, and athletic. David Buck (flute) and Ariana Ghez (oboe) played beautiful solos, and there were many other notable contributions too numerous to list. Dvorak’s Carnival Overture opened both concerts. Mr. Jarvi let it progress naturally, adding a little extra drive in the recapitulation. Thursday night’s rendition was a little rough around the edges, but things were largely smoothed out by Saturday night. Despite Mr. Jarvi’s long delayed return, the publicity for these concerts focused on the appearance of three different cellists as part of the Inaugural Piatigorsky International Cello Festival being presented by the LA Phil and the USC Thornton School of Music (among others). First up was Ralph Kirshbaum, the festival’s artistic director and holder of the Piatigorsky Chair at the Thornton School, performing Dvorak’s Cello Concerto. He gave a broad yet tempered account, with a third movement that had spirit and breadth. It wasn’t the cleanest performance, but it was a good performance nonetheless. 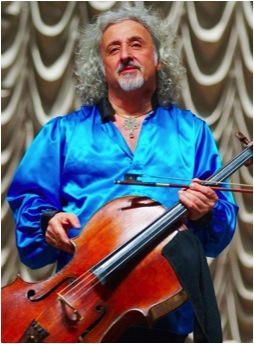 On Saturday, Mischa Maisky‘s performance of Shostakovich’s Cello Concerto No. 1 and Lensky’s Aria from Eugene Onegin went beyond good. Wearing a bright blue, blousy silk shirt, he grabbed the audiences attention from the moment he stepped onto the stage and held onto it throughout. He had a penetrating sound, dramatic and lyrical in the transcription of Tchaikovsky’s aria. Afterwards, he gave the concerto a spellbinding performance, with a particularly intense and dramatic cadenza. Jarvi and the LA Phil gave him appropriately sardonic support, Andrew Bain nailing the prominent horn part with bite and range of timbre and color. The crowd gave soloist, conductor and orchestra a huge ovation, and after four curtain calls, Mr. Maisky sat down to give a warm rendition of the Sarabande from Bach’s Cello Suite No. 5 as an encore. The crowd was quite a bit younger on both nights than with most LA Phil concerts, and perhaps this accounts for some of the restlessness before and during the concert, especially on Saturday night: extraneous activities included a paper airplane landing in a seat nearby me before the concert, and another one falling onto the stage during the concert. Saturday, Frank Gehry was seen wandering WDCH with an entourage of about eight people, pointing out things here and there. I can’t imagine a better tour guide and briefly considered joining in, but thought better of it. Acoustician Yasuhisa Toyota was also in the hall, but not with the group. Among the other luminaries out and about was Ronald Leonard, retired LA Phil Principal Cello, former Piatigorsky chair holder at USC, and current professor at the Colburn School. Speaking of cellists, Tao Ni has officially taken his place as the orchestra’s new Associate Principal Cello. Peter Stumpf remains listed as Principal Cello on leave, but it looks like his move to the Jacobs School of Music at Indiana University has become permanent, and the orchestra will hold auditions for his replacement in May. The printed program once again made no mention of prior LA Phil recordings of the works on the program, in this case the three recordings of the Dvorak Carnival Overture. The recordings conducted by Zubin Mehta and Andre Previn may be hard to come by, but the Christoph Eschenbach version was released on iTunes not long ago. Tags: Andrew Bain, Ariana Ghez, David Buck, Mischa Maisky, Neeme Jarvi, Peter Stumpf, Ralph Kirshbaum, Tao Ni. Bookmark the permalink.